This species is accepted, and its native range is Ecuador (Manabí). Terrestrial; stem to 19 cm long, ca. 1 cm diam. ; roots dense, ascending, green to whitish, pubescent to smooth, short, 1-1.5 cm long, 5-6 mm diam. 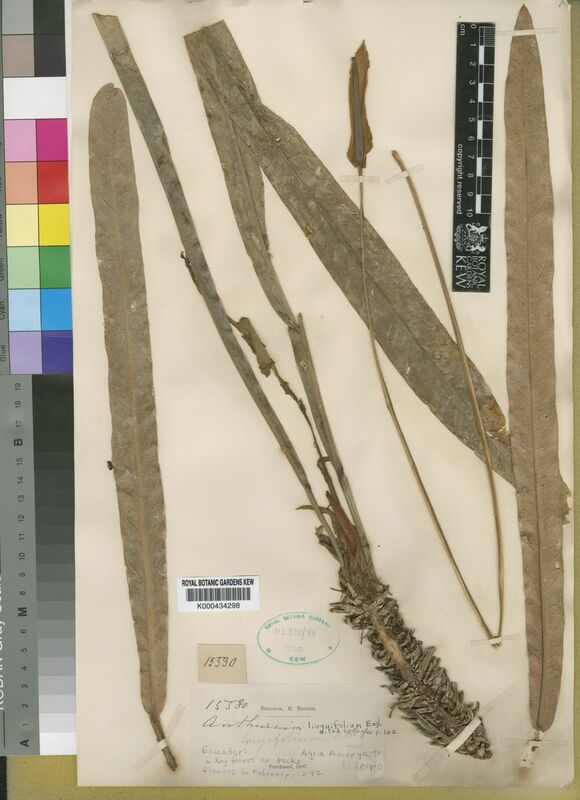 ; cataphylls subcoriaceous, linear-lanceolate, 3-10.5 cm long, obtuse to acute or acuminate at apex, drying reddish brown (B & K yellow-red 4/10), persisting ± intact, splitting at base. LEAVES erect-spreading; petioles 4-7 cm long, 5-7 mm diam., erect-spreading, subtriangular, convexly raised to obtusely ribbed, sometimes broadly sulcate adaxially, the margins sharply raised, somewhat rounded and sharply 1-ribbed abaxially, conspicuously swollen to 14 mm diam. at base; geniculum slightly paler and conspicuously thicker than petiole, 0.5-2 cm long; blades subcoriaceous, oblong-linear, acute, sometimes apiculate at apex, acute to rounded at base, 25-85 cm long, 2.5-6.5 cm wide, broadest at or near the middle, the margins broadly and shallowly undulate; upper surface matte to semiglossy, medium green, lower surface matte, conspicuously paler; midrib above obtusely raised at base, becoming sharply and acutely raised and higher than broad toward the apex, pale-speckled, slightly paler than surface, below acute throughout, paler and more yellowish than surface; primary lateral veins 8-15 per side, departing midrib at 30-60(-70)° angle, not well distinguished from interprimary veins, slightly arcuate to the margin, weakly sunken to weakly raised in shallow grooves, rather obscure above; interprimary veins almost as conspicuous as primary lateral veins; tertiary veins obscure above, conspicuously darker than surface below, prominulous on both surfaces when dried; collective vein usually arising from near the apex, sometimes from near the base, obscure above, equally as prominent as interprimary veins below, 1-7 mm from margin. INFLORESCENCES erect-spreading to spreading, shorter than or equalling leaves; peduncle 38-57 cm long, 4 mm diam., 7.6-19 (38) x as long as petiole, green, terete; spathe spreading to reflexed-spreading, coriaceous, yellow- green, sometimes tinged with purple abaxially (B & K yellow-green 5/7.5), narrowly lanceolate, 7-8.5 cm long, 0.8-1.5 cm wide, broadest near the base, inserted at 45° angle on peduncle, acuminate at apex (the acumen inrolled), obtusely rounded at base; spadix glaucous, dull lavender-purple (B & K purple 5/2.5), sessile, slightly tapered, cylindroid, erect, 5-8.2 cm long, 7-9 mm diam. near base, 4-6 mm diam. near apex, broadest at the base; flowers 4-lobed, 2.1-2.6 mm long, (1.5)2.4-3 mm wide, the sides weakly sigmoid; (4)7-9 flowers visible in principal spiral, (3)5-7 in alternate spiral; tepals matte; lateral tepals 0.8-1.4 mm wide, the inner margins weakly concave to slightly rounded, the outer margins usually 2-, sometimes 3-4-sided; pistils emergent, bright green (B & K yellow 5/2.5); stigma ellipsoid, 0.3-0.4 mm long; stamens emerging in a regular sequence from the base, the laterals preceding the alternates by 9 spirals, the 3rd stamen preceding the 4th by 3 spirals, borne at edge of tepals in a circle around the pistil; anthers straw-colored (B & K yellow-red 9/10), 0.6 mm long, 0.8 mm wide; thecae ovoid, slightly or not divaricate; pollen pale yellow (B & K yellow 9/2.5), sweetly scented at anthesis. INFRUCTESCENCE with persistent spathe; fruits not seen. Known from only two collections made in coastal Ecuador in Manabí province, between Bahía de Caraquez and Canoa. Very dry tropical forest life zone.